International Airbus A320 heads away on a northerly track around London. After an on time departure from London Heathrow, this British Midland International Airbus A320 heads away on a northerly track around London. 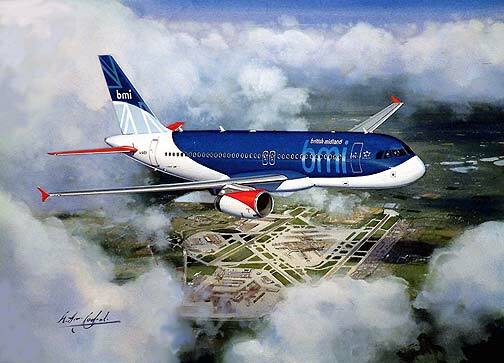 British Midland although squeezed at both ends of the market by the big commercial airlines at one end and the cheap no frills operators at the other; continue to go from strength to strength. Released as a limited edition of just 250 each signed and numbered by the artist Anthony Cowland G.Av.A.